Some of the world’s largest insurers are eagerly pitching cities, states and even school districts on policies designed to pay out quickly with few questions in the event of extreme weather. The catch: Even a hurricane might not be extreme enough. It’s called parametric insurance, and it aims to provide a quick-cash payout within days after a storm hits, beating federal disaster aid to the punch with no restrictions on the money’s use. Among the recent clients of reinsurer Swiss Re AG are Louisiana, one of the most hurricane-prone states, and the Miami-Dade County school board. 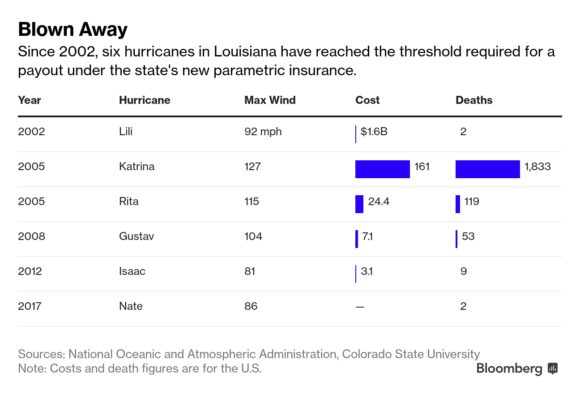 Louisiana gets up to $1.25 million if a named storm produces winds of 80 miles per hour for at least a minute, while Miami-Dade gets $10 million if wind speeds there exceed 87.5 miles per hour. But it’s a gamble: In 2017, Hurricane Irma’s winds fell short of that level in Florida, while still causing the school district $19 million in damage. “You’ve got to balance how much premium you’ve got to pay versus the possibility of getting a covered event,” said Michael Fox, the school board’s risk and benefits officer. Fox doesn’t regret buying the insurance, he said, and he expects the board will renegotiate the trigger when the policy expires next month, even if it raises the price. The money can be used for operations or emergency repairs, costs that may not be repaid by the Federal Emergency Management Agency. Even when they are, that money can take years to arrive, he said, noting that the board is still waiting for FEMA funds from Irma. The recent spate of extreme weather events have proven expensive for insurers. Natural catastrophes cost the industry $80 billion last year, double the average for the past 30 years, according to Munich Re AG. Insurers such as New York-based Travelers Cos. are seeking to raise rates on homeowners policies in California after last year’s deadly wildfires, while European insurers including Italy’s Assicurazioni Generali SpA and France’s Axa SA have been working to address climate change by divesting from some fossil fuel-tied assets or refusing to underwrite certain projects. Parametric policies offer insurers a way to cover risks without the messy complications of sending in a flood of adjusters to assess the damage after a catastrophe. Coupled with the speed of payment that insurers say they can provide with those policies, that could ease the post-crisis burden for both sellers and buyers. Louisiana signed a three-year contract last summer. If there’s a payout, the state can use the money however it wants, including to cover things that property insurance and federal disaster aid don’t, such as lost tax revenue. Six of seven hurricanes that have made landfall in Louisiana since 2002 would likely have triggered a payoff, depending on where the devices that measure the wind were placed. The strongest winds — 126.5 miles per hour — were recorded by Katrina in August 2005. The latest storm with winds high enough for the payoff came in October 2017, when Nate had winds of 86.3 miles per hour. These policies aren’t entirely new. But in the past, they were used mainly for weather-sensitive businesses. For instance, a retailer selling winter coats might be able to get a policy that would pay the company if the weather was too warm, dinging those sales. Axa cites an example of a water company using a policy that would pay out if there was a prolonged weather freeze. 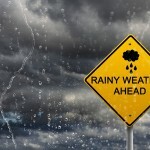 Increasingly, though, as climate change has stirred up extreme weather events across the country, insurers have seen an opportunity to expand the customer base to states and communities. After the Haiti earthquake, Alabama became the first U.S. government to buy such a policy, according to Swiss Re. The state never received a payout and decided not to renew it because of a price increase, according to the Alabama Department of Finance. Parametric policies have their charms, according to Kathy Baughman McLeod, director of the Atlantic Council’s Adrienne Arsht Center for Resilience. These policies can serve as a bulwark for vulnerable cities and states against disaster-induced budget shortfalls, rising borrowing costs and population flight. To some city leaders, falling bond ratings are a more immediate threat than rising seas. Still, little is known in the U.S. about how the product works in real life, or even how widely they’re used. No U.S. government has ever made a claim under a parametric policy, according to Swiss Re. Meanwhile, the National Association of Insurance Commissioners says it doesn’t collect data on parametric policies. Swiss Re’s Kaplan calls it a fluke that none of the policies have yet been triggered. There just haven’t been any large-scale events where they’re now being used since the 2005 hurricane season, he said. Parametric insurance, though, does have a track record in developing countries, where traditional insurance based on claims data was impractical because that data didn’t exist. 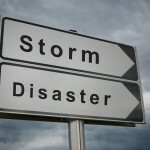 Instead, insurers began offering policies that would pay governments if a storm exceeded a particular parameter. The approach gained popularity in Africa, Latin America and the Caribbean – including Haiti, where the 2010 earthquake triggered a $7.8 million payout that represented about 20 times the amount of its premium. Miami-Dade’s Irma experience underscores the gamble for those buying in. Parametric policies create “what insurance nerds call basis risk,” said David Eckles, a professor of risk management and insurance at the University of Georgia’s Terry College of Business. 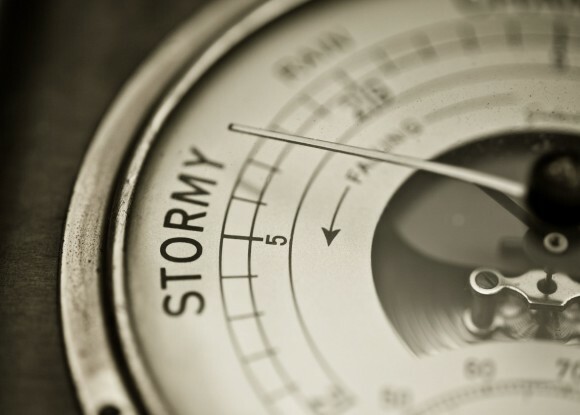 Basis risk refers to the mismatch between the policy’s parameters and the actual event, such as a storm where the damage inflicts a loss on the insured party but doesn’t trigger the precise measurements to generate a payout. Other state governments have expressed interest in the idea, but haven’t yet dipped into the market. Hawaii’s state legislators, for instance, have proposed bills in recent years to look into a parametric option, but those efforts failed to pass. Meanwhile, Swiss Re isn’t alone on the field. Axa has been building a parametrics business, with much of the public sector part of the portfolio being focused outside of the U.S., according to Karina Whalley, public sector business development manager at Axa’s global parametrics group. The French insurer is now looking to increase its presence in the U.S. after its acquisition of XL Group Ltd., she said. As climate change takes an ever-larger chunk out of local governments’ revenue, the demand for parametric insurance will grow, according to Swiss Re’s Kaplan. “If you can offload a risk off the back of your citizens and taxpayers into a willing and able private market, that’s something that should be reviewed and explored,” he said. Still waiting on funds from FEMA. Wow! !